Dodgers Blue Heaven: Welcome to the Blue, Walker Buehler! The Dodgers consensus #1 prospect is officially heading to Los Angeles, and frankly that's amazing. In fact, I find it difficult to wrap my head around it. I say this because right-handed hurler Walker Buehler -- just drafted in 2015 -- spent most of last year in the DL due to Tommy John surgery and has since thrown only 93 professional innings in his career. Now, he's preparing to play on a Major League ballfield. "He's had a very quick ascension," Roberts said of the 23-year-old Buehler. "He's ultra, ultra competitive and ultra talented." Whether or not Buehler will get a spot on the Dodgers' playoff roster is still up in the air, but the Dodgers see his callup as an opportunity for Buehler to get some much-needed experience in the Majors and to help the club down the stretch. "It all depends on how he fares," Roberts said about Buehler possibly making a postseason roster. "He's going to get opportunities, but when you're talking about the postseason, we're really not thinking about a postseason roster. I can honestly say that. We want to put eyes on him. He's earned it. To be around our guys, Kenley [Jansen], Clayton [Kershaw], Rich [Hill] and have Rick [Honeycutt] put eyes on him, this is a good thing for his development. He's going to get opportunities and like I say, every day is a test." Will he be the next great Dodger pitcher? Only time will tell, but I'm hoping we get a glimpse of that wonder here this September -- And heck, maybe October. BTW, you can follow Walker on twitter here (at the appropriately named): @buehlersdayoff. He flashed better-than-ever stuff when he returned from Tommy John surgery last summer, and he has maintained it throughout 2017. After working with a low-90s fastball at Vanderbilt, Buehler now operates in the mid-90s and touches 99 mph with life and an easy delivery that helps his heater play even better than its velocity. His low-80s curveball is a plus pitch with depth and ranks as his best secondary offering, though his upper-80s slider is nearly as good. He also can turn his slider into a low-90s cutter and has feel for a changeup that has its moments. Buehler entered 2015 as the top-rated prospect at Vanderbilt -- ahead of No. 1 overall choice Dansby Swanson and No. 8 pick Carson Fulmer -- but injured his elbow before the season began. He never looked his best and dropped to the Dodgers with the 24th selection, then had Tommy John surgery that August after signing for a below-slot $1,777,500. He returned to the mound 11 months later, looked better than ever in short stints in the Minors and during instructional league, and has continued to do so in 2017. Buehler usually operated with a 90-96 mph fastball in college, and he opened eyes by throwing in the mid-90s during his brief pro debut and hitting 99 during instructional league. He has maintained that velocity as a starter on tight pitch counts this year, and he backs up his heat with an array of impressive secondary pitches. He can miss bats with both his curveball and slider (and morph the latter pitch into a harder cutter), and his changeup shows flashes of becoming an above-average offering. 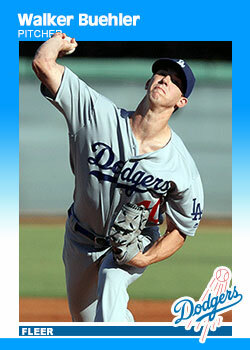 Because Buehler has a slight build, there were concerns about his durability even before his elbow gave out. His athleticism and strike-throwing ability should help his cause, and he was able to repeat his delivery and maintain his stuff into the later innings while at Vanderbilt. If he stays healthy, he has the look of a front-of-the-rotation starter, though he'll have to settle for being No. 2 behind Clayton Kershaw in Los Angeles. 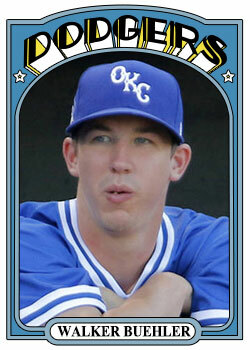 In celebration of Buehler's promotion I made three fantasy Baseball cards depicting him. Check them all out above. 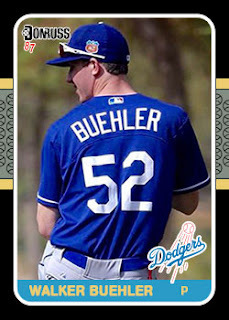 Buehler, 23, will make his first career appearance on a Major League roster in his second professional season after being selected in the first round (24th overall) of the 2015 First-Year Player Draft out of Vanderbilt University. Buehler, who is rated by MLB.com as the Dodgers’ No. 1 prospect and is currently rated by Baseball America as the 17th best overall prospect in baseball, went 3-3 with a 3.35 ERA (33 ER/88.2 IP) and collected one save in a combined 28 games (19 starts) with Single-A Rancho Cucamonga, Double-A Tulsa and Triple-A Oklahoma City. He also held hitters to a combined .208 average, while striking out 125 batters against just 31 walks in 88.2 innings. The Lexington, Kentucky native and the 2017 Dodgers Branch Rickey Minor League Pitcher of the Year, started the year dominating the California League, posting a 1.10 ERA (2 ER/16.1 IP) in five starts, before his promotion to Tulsa on May 10. Buehler then made 11 starts for the Drillers, going 2-2 with a 3.49 ERA (19 ER/49.0 IP), a 1.12 WHIP and a .225 opponent’s batting average. He was named Texas League Pitcher of the Week after his start on June 30, in which he fired 5.1 scoreless innings while allowing just two hits and striking out seven against only one walk. Buehler was promoted to Oklahoma City on July 16 and made three starts – including his first Triple-A victory on July 31 (5.0 IP, 0 R, 3 H, 6 K) – before being moved to a relief role in August. Since moving to the ‘pen, Buehler has recorded one save and has struck out 19 batters against just five walks in 13.1 innings of relief. Overall, he has limited the opposition to a .216 average with the OKC Dodgers.